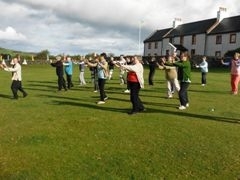 Re-Vitalise Tai Chi, Yoga and meditation retreat on the wonderful Holy Isle, Arran, Scotland. Re-Vitalise Retreats are running a full board week of Tai Chi, Yoga and Meditation Retreat at the gorgeous Holy Isle, Arran, Scotland. Ideal for both beginners and experienced. We will take you through the fundermentals of Tai Chi, Yoga and meditation. The focus of the week is the Buddhist concept of mindfulness. Holy Isle is the perfect place for this type of retreat. A Buddhist Island, extremely peaceful and tranquil. Come along and find out why people keep coming back to this retreat!